God Can Reconcile Friends – Praise Him! God is good! Have you ever had something nagging at you, maybe it was a concern, but you haven’t really specifically prayed about it? You carry it around and periodically pull it out and look at it when no one else is around, then put it away again. But then, God just takes care of it. Even as good as I try to be about taking all my cares to the Lord, I sometimes find myself still holding on to small worries. Several years back I had a dear friend become distant. I went to her and inquired if there was anything wrong, fully prepared to apologize and reconcile. She denied any issue; however, our relationship was never the same. That was fourteen years ago. Since June of this year, she and this “non-issue” have been on my mind. I’ve been debating if whether or not I should make another attempt to reconcile. Maybe the Lord had put her on my mind lately to re-establish my desire for reconciliation. Today, my long lost friend reached out to me in a very specific way to re-establish our friendship. I am so happy about this latest development. Obviously, God had been speaking to her as He had been speaking to me and now we are able to move forward as friends again. As I organize my prayer closet tonight, I am going to give God praise for His goodness and care for my concerns. It is important that as things develop throughout our day we recognize these moments to praise our heavenly Father. He is good. He cares about every little thing that I care about; time and time again, God has proved this to me. Praise His name! 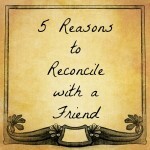 How do you reconcile with a friend? Scripture states that when you believe someone has something against you or is upset with you, whether you think they are right or wrong, you are instructed to go to that person to reconcile. Have a humble attitude. This will not work if you are too caught up thinking that “She just needs to get over it!” or “I didn’t do anything wrong!” It is not going to go the way God intended if you are on the defensive from the get-go. Pray for the right opportunity. This attempt to reconcile needs to occur at the right time and in the right setting. It may be done in person, or in a letter or over the phone, but just be aware when you run into that person in public that that may not be the right time or place. Let the Holy Spirit direct you to the right method and time. “…and the wise heart will know the proper time and procedure. Say the right words. You have the humble attitude, now let that attitude come through the tone of your words. If you are unaware of what caused the issue you may say something like this: “Deb, I feel that lately there has been some distance between us, and I need to know if I have done something to offend you because if I have I want to make it right.” If she discloses the issue, listen closely and don’t be defensive. Remember the key here is to reconcile! If you are clearly at fault, share why you felt you did what you did (humbly, not defensively), and ask for forgiveness. If she is reluctant to share what her feelings are at that time, just let her know that when she is ready to talk, you will be available. 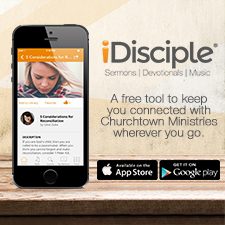 Also confirm how important it is to you that you reconcile any differences, as well biblical. If she denies a problem, then move on respectfully with your friend as if everything is okay. If you still sense something is wrong, then continue to pray for a reconcilation moment, and I believe God will provide, and give you your heart’s desire. Remember, the goal is always to reconcile no matter who is in the wrong or who is misguided in their thinking on the subject, and that can only be accomplished in humility. Is there someone who you need to reconcile with??? If so, you have now been equipped. Onward! Click here to subscribe to Gina’s blog. Award-Winning Author Gina Duke is a wife, mother and Director of Women’s Ministry at her local church. With a B.S. in Organizational Leadership, she is able to bring a clear word for authentic Christian living. Through her book, “Organizing Your Prayer Closet: A New and Life-Changing Way to Pray” (Abingdon Press), she imparts 1 Peter 4:7 with the gift of structured prayer journaling. 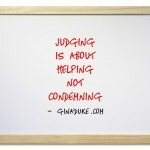 Ms. Duke also blogs and offers numerous videos and resources at GinaDuke.com. You may also follow her on Twitter and Instagram @TheGinaDuke. P.S. I invite you to subscribe to my blog again before you leave. Just click here and enter your email in the box at the right of your screen. P.S.S. If you enjoyed this post, then why not share it with your friends??? I’ve lost my bestfriend, Angeline. We were very very close in the past and well i’ve done something wrong and have hurt her so so badly. I’ve said things i shouldn’t be saying when i am angry and that caused her to be hurt and not only that because of some other things trust has been broken and right now she hates me pretty much. After accepting christ i come to realise i shouldn’t be saying things i don’t mean when i am angry and i am really very sorry for what i have done. I know trust can’t be built back over night but it has already been 3 months. Now we are like strangers with memories and im pretty sure she still feel hurt. I really truly sorry for whatever i’ve done wrong and would like to make it up to her… Please help me pray for a reconciliation in this friendship. It really seems impossible because the closer you are to someone and once trust is broken its much harder to gain it back because she have a reason to not trust me again. Therefore this needs more than a miracle for this friendship to reconcile. So please help me pray for a reconciliation in this friendship and also restoration and healing, that god will touch her heart and forgive me… And also pray that i’ll have a opportunity to apologise to her and that my sincere apology would touch her heart by the power of god.. Please help me because this friendship really really mean alot to me. It really does. please help me.. Thank you for sharing your heart during this sad time. My prayer for you is that God will provide an opportunity for you to properly apologize to your friend and that reconciliation will be established. I pray that God will give you the right words and in the meantime, comfort you until your restoration moment comes. I am sorry to hear that reconciliation has not yet come. If you feel like you need to DO something else or more, I recommend reading Gary Chapman’s 5 Languages of an Apology to insure that you have properly apologized in such a way that your friend feels was acceptable to her. You may continue to pray for reconciliation and restoration and then you must wait upon the Lord. No one mistreated another more than Laban did his son-in-law, Jacob. And no one could blame Jacob for fleeing from Laban (Gen 31); however, I believe through a strange sequence of events using a false idol that Rachel had stolen from her father, that God orchestrated one last meeting between them so they could reconcile. It was not because Laban deserved it, but because God desires for us to be reconciled with one another (Note that the next few chapters go on to detail Jacob’s reconciliation with Esau). However, in the end, despite the fact that Laban did not even apologize to Jacob for all he had done against him, they entered into a mutual covenant to not harm one another again then the last verse of this chapter basically says that they parted as friends. The key word here for you is “parted”. They did not continue to hang around together, but went on in their separate lives. And this may be what happens in your case. Forgiveness does not always mean everything will go back to the way it was. Depending on the severity of the offense, some wisely establish boundaries with others whom they fear may hurt them again, and it does not mean that unforgiveness remains. With that being said, I do believe that God is faithful, and at His appointed time He will give a you a moment of restoration regarding that relationship. I don’t know how it will come about or what it will look like, but watch for it. I hope to hear back about how God does work in your situation. Keep your eyes focused on Him. Live out Psalm 37:4 and Matthew 6:33 and see what God does. I will pray for you and your situation, my friend. I have a colleague whom I regards her as a close friend, when we first started working together, we were very happy however few months later she suddenly became very cold towards me and seems to deliberately distant herself from me. I asked her in a very concerned manner asking if I had did something wrong to her and if yes, I’m sorry. Who knows, she get even more angry saying she dislike people confronting her. Even though I explained to her that I asked her because I treasure our friendship, I care about her but she just flare up and get angry with me. Since then she has been very mean to me, refused to go out for lunch with me, in the office when we are having lunch, she will have ways not to sit with me. She always behaved as if I’m transparent, in some gatherings when we had with common friends, sometimes we took photos and posted in Facebook. Whenever the photos has “me”, she will never never “Like” the photo but if the photo is without me, she will like the photo. To be frank, I’m really very very nice to her in a lot of ways, I’m always showing a lot of care and concern for her in many areas in the past. In terms of money, I’m not calculative towards her though I myself is a very thrifty person. I really feel that I have done a lot for her, put in a lot of effort in our friendship. I don’t know where have I offended her that its almost 3 months and she is still behaving mean to me. Then once a while, she suddenly became ok with me, just when I thought we have reconciled, the next moment she behave mean to me again, treating me hot and cold. I’m really going mad, I can’t ask her what have I done wrong because she will get even more angry for me asking. I really don’t wish to give up this friendship but yet I am always suffering from a lot of hurts, pain and disappointment from her. Sorry to hear about your work relationship issue; it can make the workplace miserable. Although, I can’t really tell you what to do, I know what I would try to do, and I will share those thoughts with you. Approaching your co-worker to try to find out if there was an issue so you could apologize, if needed, was the right thing to do. As for how your work relationship has unfolded since then, with the hot & cold treatment, I would just continue to be nice to that person. Everybody has this type of issue at some point or the other. 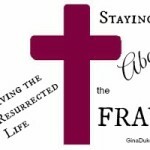 I recently wrote a blog post about this on Good Friday (4/18), “Living the Resurrected Life/Staying Above the Fray” where I talk about this type of scenario; hope you read it. A certain percentage of people will not like us, not matter what we do to be nice, so we just have to accept that. Some girls, and even women, are just “mean girls”, and they use these type of tactics to maintain some kind of control over others (bc they have issues). When at work, focus on maintaining a pleasant, professional relationship with her. I would not cater to her by complimenting her, buttering up to her in order to get her to like you. If you want to compliment her for something, only do it if you are genuine, expecting nothing in return. I wish I could give you some quick-fix idea, but people are complicated. As God’s people, we are called to display the Fruit of the Spirit: love, joy, peace, patience, goodness, gentleness, kindness, faithfulness and self-control. (Gal 5:22-23). This is our responsibility when reacting/responding to others. All you can do is concentrate on your behavior, making sure that you remain God-honoring in all of your actions. God may be allowing this situation to grow and ripen your “Fruit”. I’ve actually had moments in the workplace like these that have been ongoing like yours. I have found that when I view it as a “testing” of my faith, I begin focusing more on achieving the goal of pleasing God through that hardship that my attention comes off the person mistreating me. Maybe I am weird, but I see it as a personal challenge, and I am like “Bring it! What do you have for me today!”, because I plan to be victorious and am being equipped for a greater work!!! In the end, Jen, you are loved by God, and I think you should focus more of your time building life-giving, meaningful relationships with the other co-workers, exude the love of Jesus, pray for this coworker, and see what God does in you! I have a very dear and best friend who has been very kind to me however I am extremely suspicious of another person who has recently entered the picture as a friend. I have made my suspicion known to my friend and have even breached thenorivacynod her cell phone to see their communication. I have found that my friend has lied about their closeness and has denied at times even being on contact with the new friend. My continue insistence on severing the friendship with the other has created a significant breakdown in our friendship of 14 years. I know ideas wrong to breach her privacy but I also know she she lied to me repeatedly about the other friend whose motive I simply do not trust. I love my friend dearly and don’t want to lose her but she is angry and cold with me. Please give me guidance on how to approach the matter. Here we have a combination of lies and deception and broken trust. This is complicated.